Indian Plum is 5 m tall shrub that is found in North America from British Columbia south to northern California. In British Columbia, it is found in the extreme southwest corner of the province, on the mainland and on southeastern Vancouver Island. It is one of the first native species to flower in the spring, coinciding with the arrival the Rufous Hummingbird, and has been observed flowering as early as the last week in February. Flowers are in loose drooping clusters of white flowers and are mostly unisexual, with male and female flowers on separate plants. Fruits are initially orange in colour, turning blue as they ripen. 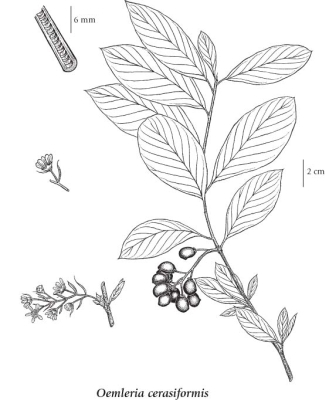 Medium to tall shrub, 1-5 m tall; stems clumped, arching; pith chambered; bark bitter, purplish-brown. Alternate, deciduous, lanceolate to oblong-egg-shaped or elliptic, short-stalked, the stalks 5-10 mm long, the blades 5-12 cm long, not toothed, pale green and smooth above, paler and often sparsely hairy below; crushed leaves smell like cucumber. Inflorescences loose, drooping, bracted, 5- to 10-cm long clusters, at the ends of short axillary branchlets, of several (5 to 10) stalked flowers; flowers mostly unisexual, the male and female flowers on separate plants, appearing very early in the year, as the leaves develop; corollas greenish-white, saucer- to cup-shaped, about 1 cm across, the petals 5, egg-shaped, 5-6 mm long, spreading (shorter, narrower and erect on female flowers); calyces 6-7 mm long, 5-lobed, the lobes about equalling the top-shaped hypanthium; ovaries (female plants) usually 5, superior; stamens 15. Fleshy drupes, like small plums with a large stone, bean-shaped, about 1 cm long, peach-coloured, ripening to bluish-black with a whitish bloom, 1 to 5 per female flower; seeds 1 per drupe. Moist to dry open forests, forest edges, thickets, streambanks, clearings and roadsides in the lowland zone; frequent on S Vancouver Island, the Gulf Islands and the adjacent mainland; S to N CA. In 2010, this species was noted flowering on February 25th. 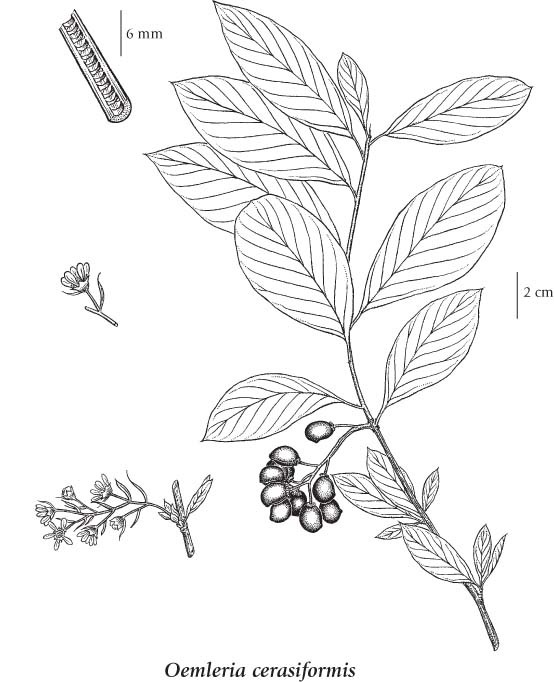 A shade-tolerant/intolerant, submontane to montane, Western North American deciduous shrub distributed more in the Pacific than the Cordilleran region. Occurs in maritime to submaritime summer-dry cool mesothermal climates on fresh to very moist, nitrogen-rich soils often with a fluctuating groundwater table. Its occurrence decreases with increasing latitude and continentality. Scattered in broad-leaved forests on water-receiving sites (most often on floodplains) with melanized and often gleyed soils. Commonly associated with Cornus sericea, Sambucus racemosa, and Symphoricarpos albus. Characteristic of Moder and Mull humus forms.